Since X-E moved to Dinosaur Dracula, a new calendar was a surprise. It is now hosted by the Dino Drac character created during the Con-Nec-Tors article. While there wasn't much in the way of plot, and it wasn't connected to the previous saga (aside from an easter egg), a few new characters emerged. On the first day Dino Drac opened a box containing Safari Man, and the following days contained accessories meant for him, but Dino Drac took them for himself. 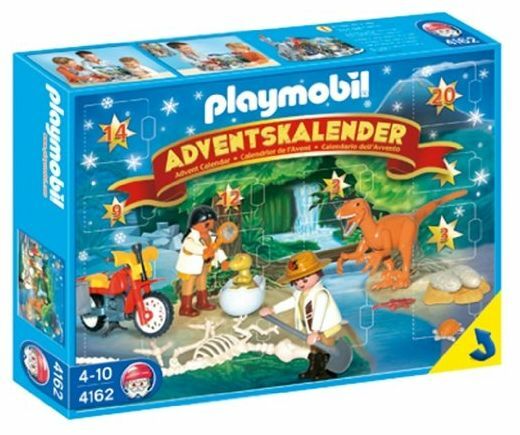 Things got ominous later when Dino Drac receieved a Shovel and pickaxe, followed by a dinosaur skeleton. He felt uneasy assembling it due to the closeness in species. Later one small lizards, snakes, bugs, or perhaps baby dinosaurs emerged. Halfway through another person emerged, who was a Safari Woman, and was named Gracie. She soon disappeared while Dino Drac got more rocks and eggs. On the last day the group reassembled, and Gracie shows signs of hand energy characteristic of the Mare Sisters, and Dino Drac declared the year to be a positive one.